Gary Cahill has had a very good career but as he looks back over it there is still one thing missing. He has been the most accomplished English centre-back of his millennial generation – post Rio Ferdinand, post John Terry – winning every club trophy he has played in: Champions League, Europa League, League Cup, two Premier Leagues, completing the set with the FA Cup 10 days ago. But like every English player who arrived after the Golden Generation era – the three consecutive quarter-finals in 2002, 2004 and 2006 – Cahill has never been part of an England team to make any serious impression on a summer tournament. This generation, which has 32-year-old Cahill at its upper end, does not even have a noble defeat to its name – and certainly no single stand-out performance to point to. 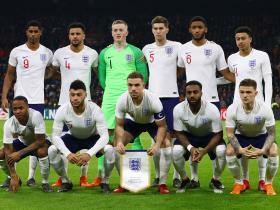 This generation of England players – born in the late 1980s and early 1990s – have only known miserable football and embarrassing exits. Managing to drag Italy all the way to penalties in Kiev six years ago somehow stands out as a high-point. But they will forever be remembered for their crippled-with-stage-fright 0-0s, just like Slovakia two years ago, their two-game elimination from the 2014 World Cup, and, above all, Iceland. Cahill may well be dreaming of lifting the World Cup at the Luzhniki on 15 July, but discussing his hopes for Russia at St George’s Park on Monday evening, he set a modest target. This summer he just wants to make an impression. And Cahill knows that this may be his last England tournament. He will be 34 for Euro 2020, and Harry Maguire, John Stones and Jamaal Lascelles will all be better players by then. Cahill almost did not make the squad this summer – Gareth Southgate dropped him for the March friendlies – and it was only his late-season improvement for Chelsea, winning back his place, that got him into the 23 here. England’s last game at a tournament, of course, was Iceland in Nice. Not many would have expected at kick-off that evening that England would be led into Russia by Roy Hodgson’s successor but one, and that they would be going without Jack Wilshere, Joe Hart and Wayne Rooney, himself the last link with the generation who made their presence felt when it mattered most.